Florida’s Democratic gubernatorial primary made national headlines as Andrew Gillum unexpectedly sailed toward victory against the polling favorites, Gwen Graham and Philip Levine. 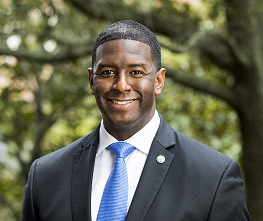 Gillum’s victory was largely made possible by his significant leads in urban locations like Orlando, Tampa, Miami – and especially, Jacksonville. According to the Florida Department of Elections’s official results, Gillum’s final count in Duval county more than doubled Graham’s. While Jacksonville has a rightful reputation as being one of the more conservative large cities in the U.S.A., we’re also a city with a significant progressive presence. From the art scene downtown to the beaches and all of the colleges & universities in between, there’s a large and growing population of younger and more liberal locals who are clearly looking for a change from politics as usual. The appeal of the moderate Democrat – someone who will largely embrace right wing policy while seeking to fix it’s worst extremes – is fading quickly. In addition to a strong showing in Jacksonville, Gillum’s campaign seems to have received a boost from his endorsement by Bernie Sanders. OurRevolution provided support for get out the vote efforts, and NextGen’s Florida chapter hit the mailboxes with cost-effective advertisements that focused on positive policy goals over personality or negative attacks. Gillum’s policy goals are intertwined, as no action can be taken in isolation. For example, Gillum’s plan to legalize marijuana would lift burdens in our overcrowded criminal justice system while also providing a new source of tax funds that will go directly to education through increased teacher hiring and higher teacher salaries. It goes without saying that our system of distributed powers and checks & balances limits how much influence one individual can have, no matter what position they’re elected to. But Gillum isn’t shy about wanting to make some very progressive reforms, and Jacksonville is stepping up to help make it happen.